I’d been thinking about it since the first time he asked and realized I had the perfect solution already at hand. I told him I’d do him one better and pulled out a Stanley 220 block plane for him to use! He was very excited. This was the very first plane I bought when I had the idea I wanted to give hand planes a try. Apparently I don’t really have much sentimental value attached to it, because it was sitting in the box of tools I’m going to sell in the near future, as I’ve since upgraded my block planes. This one is a little off in that the knob is not rosewood, like you’d normally see on a 220 block plane. It is a domestic hardwood (looks to be maple) with a reddish stain on it. After buying the first one, I picked up a second 220 with a broken body that still had the rosewood knob on it for $1, hoping to put a proper one back on mine. But the threaded post on mine was too skinny, which seems odd, so I left the non-rosewood knob on it and didn’t give it a second thought. As it turns out, that was a good thing. The other knob is a perfect gripping size for the hands of a not-quite-4-year-old boy! Since Finley goes to a Montessori school, I’m trying to give him lessons the way they do. You silently do the task while he observes, breaking it down into as many steps as necessary, then let him do it. The only verbal instructions I gave him were to be mindful of the blade, because it is sharp. I clamped some wood into the soon-to-be-replaced workbench and put a large toolbox under it for him to stand on. 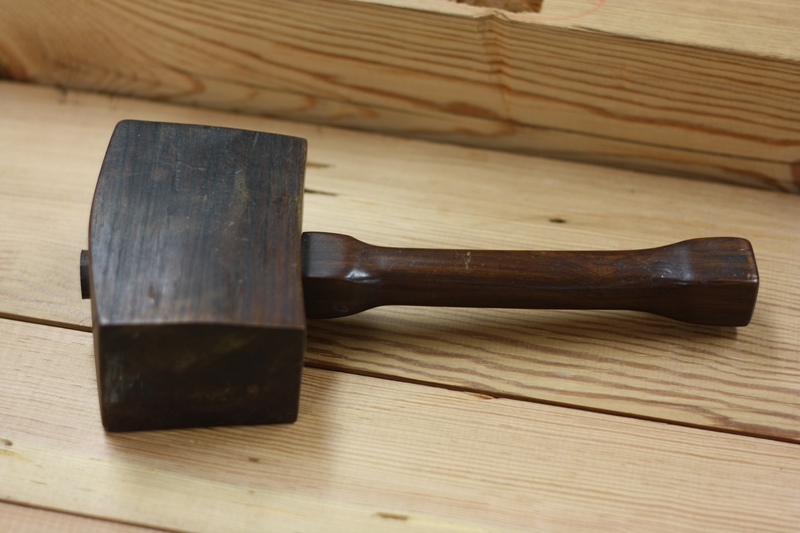 He gripped the knob with his left hand and the lever cap with his right and… started planing wood! I showed him how to get wide shavings by planing on the edge of the board and then how to get thin, curly shavings by planing the corner. He liked those the best. 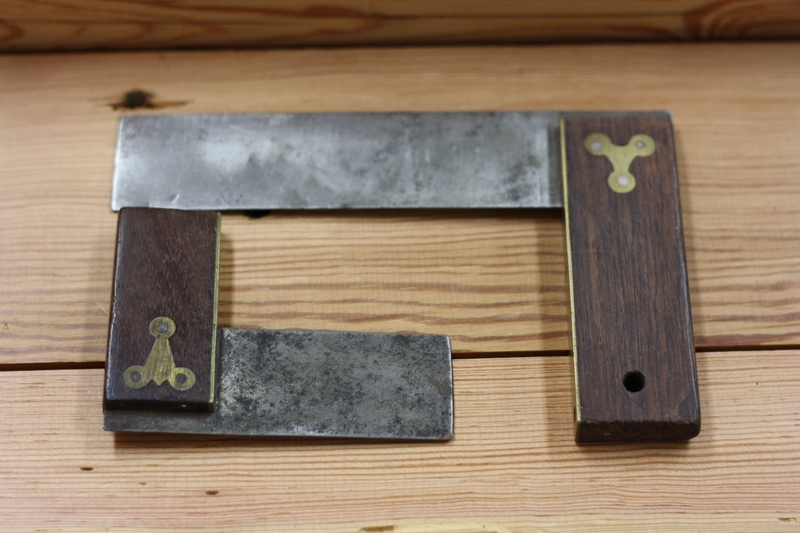 After he went back upstairs, I finished boxing up the Adria dovetail saw and then continued with another small task – picking out some tools for Finley to use. And, in case you think I’m cold and heartless, that 220 block plane most certainly has some sentimental value at this point. The one in the middle because the lower gear ratio will make it easier to turn.And the arm seems a tad longer than the one on the right, which gives more leverage. Thanks for the input. It is the one I was leaning towards, as well. As you said, it spins the easiest of the three. Like the other two, it is in as-yet untouched condition, so a quick disassembly/cleaning/oiling should make it even easier. A friend of mine that regularly works with small children in his shop (grand kids and their friends) will clip the head off of a nail to use as the drill bit in egg beater drills. Much less likely to get snapped off than a fine twist bit and in soft wood does a reasonable job. He also gets good mileage out of the cheap flush-cut pull saw you can get a Harbor Freight with the little kids. Cuts small things OK and is nearly impossible to damage. And you are only out a few bucks to replace if it does get kinked. But I don’t know how well this will translate when his grandkids are a bit older and may want to use a Western backsaw. Rob, I toyed with the idea of something like that, but I kept getting hung up on Eastern saw vs. Western saw thing. I know it’s not a big deal, and it is probably LESS of a big deal for someone so young (I’m reminded of CS teaching his daughter how to sharpen and she just did it; no big deal because she didn’t know to FEAR it), but I didn’t know how confusing it would be to start off with one style and then switch to the other. Good idea with the nail, by the way. I’m going to compile all of these suggestions, see how Finley does with all of them, and then maybe write something up. This reminds me of a time long ago when I had my diploma framed. I had it done at a shop where you could come do the work yourself after they cut the miters. They handed us all an eggbeater drill with a nail in it in place of a drill bit. It worked fine. My 5-year-old grandson has his own Stanley 118, the “boy’s plane” because made of stamped steel, in his toolbox in my shop. I liked it so much when I acquired it for him, that I got another one for myself! Thanks for the suggestion, Marty! The obvious question is, of course, do YOU use it? 🙂 If so, how does it compare to other block planes? Great post! It a wonderful feeling to have children in the shop that are willing to learn and spend time with you! 🙂 I remember when my kids were small, they loved hanging out in the shop with me. My son was with me in the shop, learned a lot from me and now has his own shop! I like your hand drills, I collect these when I can find them! He will enjoy having and using the drill and remember it forever! 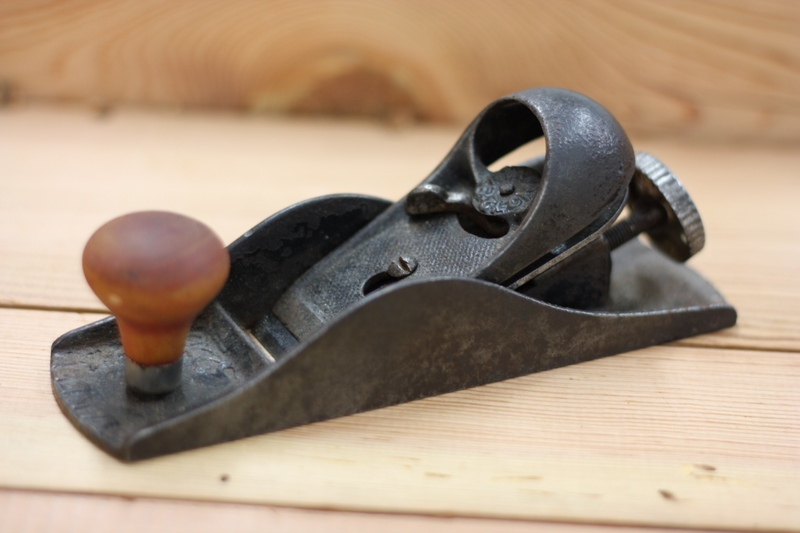 I like the idea of a block plane – I have a 60 that I use for finishing and a really crappy HD plane. 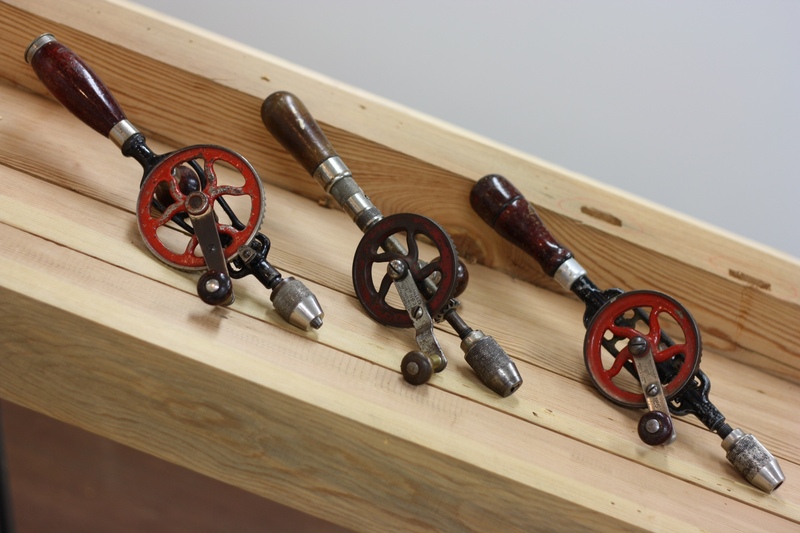 We went with coping saws and egg beaters in our shop. Ive got a 4.5 and 2.5 year old and they both do fine down there. I also picked up some beeswax finish which I use on projects around the house, and this allows them to help me with finishing too. 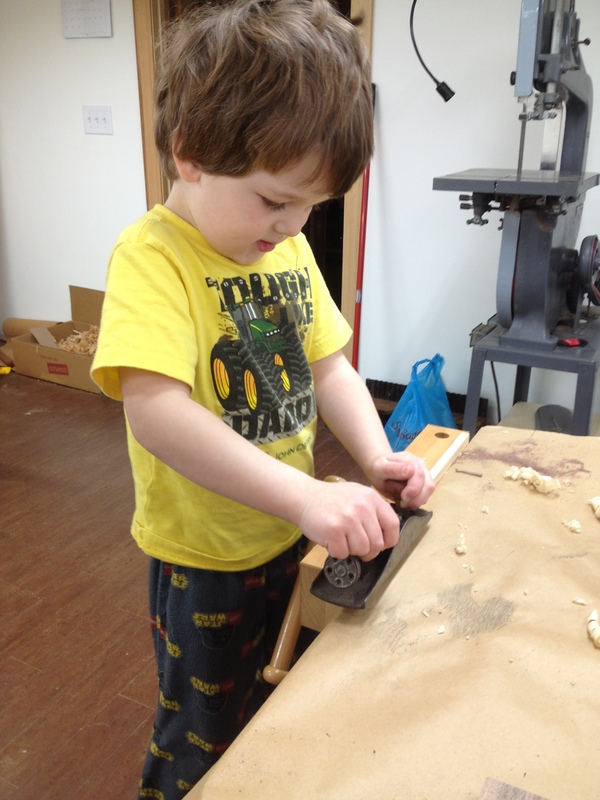 Shop time in the evenings and during nap time on the weekends – sounds remarkably familiar, Sam! I have a nice big hunk of beeswax I picked up a while back for just that purpose after spending some time with Don Williams at the Hand Works event in Amana, IA last summer. Just have to get to the point of finishing a project so Finley can help me with it! 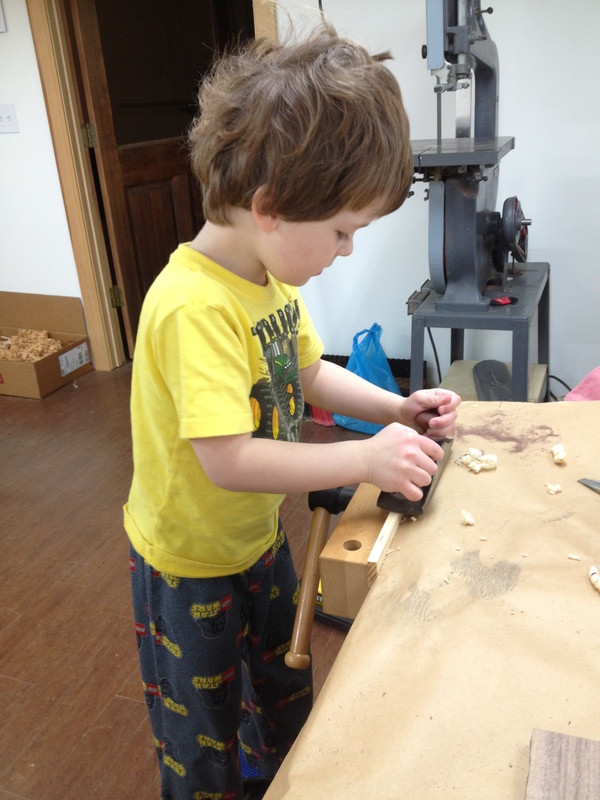 I’m going to try and keep good notes on woodworking with a little one; maybe I can work up an article out of it or something… Will be interested in following your experiences on the subject, as well! btw – your squares are much cooler than the ones I gave my boys.